I am looking for some advice please. I am doing my PADI open water course in Egypt soon. A while ago I was playing football and received a blow to my head, I was knocked unconscious for about 10 seconds max. I felt OK at first, then started to get tunnel vision and tinny hearing for about 5 minutes, then I felt OK until I was being driven to A&E. I then had trouble speaking properly and was having trouble remembering things like my DOB. I got to the hospital and was given a CT scan which the paper work says was normal. I was kept in over night for observation and given pain killers for a pretty mean headache. I was discharged the next day and I felt fine. I did have headaches for about 3 days later but since then have returned to normal and can take part in normal exercise without any discomfort. I have been back swimming and can get to the bottom of a 4 meter pool without any trouble. I saw a GP today to ask if I could be signed fit to do my PADI course. The GP has referred me to a neurologist as she was not happy to sign me off. I have managed to get an appointment but I would be grateful for any advice you may have. Advice? OK, big round balls are wrong, take up rugby instead. In the UK, over a million people visit hospital each year with a head injury. The vast majority of these will be trivial bumps and have no serious consequences, but things like unconsciousness and disturbances of brain function can be signs of more severe trauma. The question therefore is how to pick out the nasty ones from the more benign hordes. As far as diving goes, the 2 main potential difficulties are post-traumatic epilepsy and altered cognition. The chance of a seizure is directly related to the severity of the injury. Impaling one’s cranium on iron railings is far more likely to cause a fit than being hit by a squash ball (although it did quite hurt when it happened to me last week). The risk of fitting drops sharply with time after a mild head injury with only brief unconsciousness, but is more difficult to forecast with penetrating trauma. Anyone who needs anticonvulsants will not be able to dive as the drugs are sedative and can cause unpredictable susceptibility to narcosis. Altered cognition (such as memory problems) can be immediate or delayed but, if ongoing, would be detrimental to diving performance. 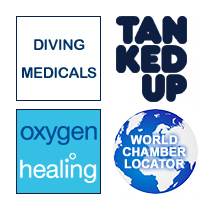 The UK Sport Diving Medical Committee has some helpful advice on this. They suggest using the length of post-traumatic amnesia (PTA) as a guide to the severity of the injury, and delaying return to diving accordingly. So for a PTA of less than an hour, you should have 3 weeks off; for between one and 24 hours, 2 months off, and if the amnesia exceeds 24 hours, at least 3 months off is advised. As your CT scan was fine, and assuming your memory problems and cognitive function are now back to normal, then you could start your PADI course a minimum of 3 weeks from the accident. Last year I sustained two skull fractures, a fractured eye socket and three jaw fractures! Is it safe for me to dive and would I pass a diving medical? Since the incident I have made a full recovery. I am fit and healthy. Yes, I went out with her as well. Never leaving the loo seat up again, me. Especially after forgetting her birthday. But I’m glad you are “fit and healthy” now, after those traumas. Funny isn’t it, a lot of people say that 2009 was their worst year. It was yours I reckon too. The deal here was how bad was the head injury? The rules state that if you lost consciousness when you got all these frags then you have to take some time off diving. Likewise, some people who get that badly hurt end up with epilepsy or other fitting after the injury. If this is the case then diving could be a real problem. Even totally contraindicated if there were fits and you are on meds for that now. Then we have your poor old jaw. Can you bite now safely on a regulator? Do you have all your teeth still? Do you look like Les Dawson? The two former and again you need to think closely about safety. You don’t want that ole reg just floating off into the blue as you gummily chase after it like your pissed grandma looking for a snog at Xmas. And the latter... well you have a career in showbiz my friend. As for the eye socket, the least of your problems, but I assume they both still move in the right direction. I’m not one to sit on the fence though. You DO need to see a dive doc for a full assessment, but as long as you are not on any anti-fitting meds, all should be fine this year. May 2010 be your “annus joyous” and not a bum year like the last one.